Due to recent changes in the Azure cloud, ClearDB will be removing the Mercury DB and Titan DB service plans from the Azure Marketplace, effective December 13, 2017. All other service plans are not impacted. If you currently use either the Mercury DB or Titan DB service plans and would like to continue to use ClearDB’s fully managed MySQL services without interruption, please simply upgrade these subscriptions prior to March 14, 2018. 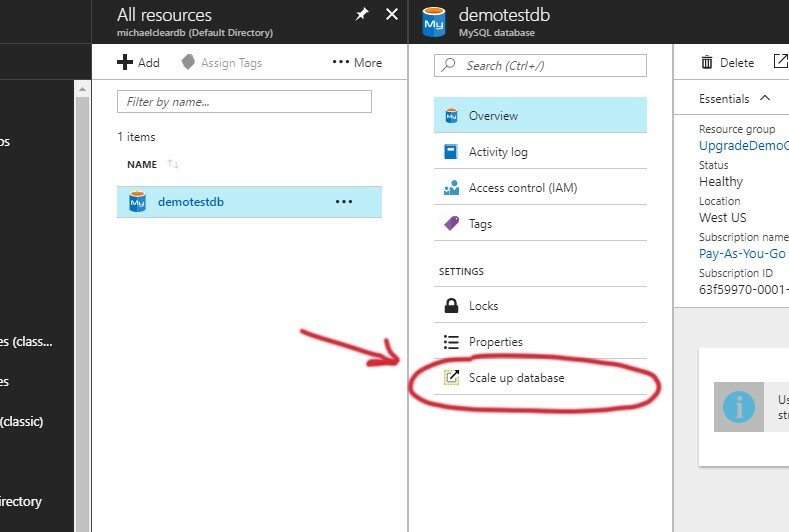 To upgrade your existing database, simply log into the Azure portal, locate your ClearDB-powered database by viewing “All Resources,” select the impacted database by clicking its name, then look for the “Scale up database” option. Clicking that link will let you choose a new subscription plan. If the “Scale up database” link doesn’t show up when you first load the blade simple re-load the blade again and it should appear. Please note that customers with a large number managed databases on the Mercury DB or Titan DB subscription plans might prefer moving them to a dedicated datastore. You can add up to 100 databases on any dedicated Developer or Production tier datastore for a flat monthly rate. Please contact sales for more information about our Developer Tier or Production Tier dedicated datastores for the Microsoft Azure cloud. If you do not wish to upgrade your ClearDB subscription, please make sure to download a backup of your database using either the ClearDB console or a third party tool like MySQL Workbench. You can then migrate it to an alternative solution prior to the change of service deadline. ClearDB’s managed MySQL database service for the Microsoft Azure cloud runs on powerful multi-master, multi-regional clusters. Your database is replicated across multiple cluster nodes to enhance access and availability, and our advanced routers detect database node failures and re-route database traffic as needed to maximize uptime. We also automate the creation and replication of database backups, and manage critical database software patching. Your data stays safe and available, and all with no changes to MySQL or to your application’s code.